I spent ten years searching for meaning in my life. What was I here to do? What is this thing called life and where did it come from? I read lots, travelled lots and met a ton of people. In 2010, a lot of the stuff I’d learned about came together in a vision of sorts – the idea for a year-long game played in a virtual world had arrived. There are many, many things, ideas and people that I can see reflected in the book. Willy Wonka, P.T. Barnum (the great American showman), The Burning Man festival (which I attended in 2011), and something called The Million Dollar Homepage – they’re all in there! I had to start with the basics. I hadn’t written a single word of creative writing since primary school, when my stories tended to end with me waking up from a dream. So a lot of my research was actually learning how to write. I’m talking the basics here – the distinction between “showing” and “telling” for instance. Could you briefly explain your research method? I think research is easier than it’s been at any point in history. The internet probably solved 95% of the many questions and queries I had. And it probably helped me solve the other 5% indirectly by helping me find the person I needed to talk to. It helped me find my editor, proofreader and cover artist for instance. I asked a couple of questions on the maths subreddit, and also used the books in my library for digging into some the technical questions I had. Overall, how long did it take you to write Solarversia? It took three months to create the plot and then one year to write the book, which took five drafts. Naturally, draft one took the longest, maybe six months or so, with the proceeding drafts taking less and less time, as you’d expect. So 15 months in total. But a fair amount of that time I spent on marketing too – contacting people on Twitter and directing them to my website where I offered them a free copy of the book if they signed up to the newsletter. I reckon the time split between writing and marketing was roughly 60/40. Do you have any other works in the making right now? I’m currently working on a novella for my company Matter, the company I took a year’s sabbatical from in order to write the book. It’s a fictionalized day-in-the-life thing, where the days are in the years 2020, 2025, 2030, 2035, 2040 and 2045. It shows the progression of technology and the impact on society and culture. Hoping to publish it by Christmas. What was your greatest struggle while writing this book? There were several occasions when my editor pointed out serious issues with the story as it stood. For example, halfway through the first draft she rightly pointed out that the various narratives weren’t interweaved in a cohesive manner. It felt like a huge blow at the time, because I knew that she was 100% correct in what she was saying. It required a lot of thinking and reworking and it was a struggle to find the energy and motivation to keep going on a couple of occasions. The Facebook purchase of Oculus Rift in March 2014 was the single event that inspired me, there’s no doubting that (I started working on the plot only a few days after the announcement). I knew that there was no better time in history to be writing a book about a game played in virtual reality and I desperately wanted it to come out in time for the launch of VR headsets onto the consumer market. Do you have a favorite spot to write? I don’t have one yet! I prefer an office environment: a tidy desk, a cup of tea and bit of background noise. Iain M. Banks, I love his sci-fi stuff, it’s incredible. I want to build the Culture – the interstellar anarchist utopian society he created – for real. What was your end goal when you started writing Solarversia? The book is meant as a promotional tool for the real world game of Solarversia, which I’d like to launch on the same date in 2020. The goal was to show people the kind of company I wanted to create, and the kind of immersive game I think people want to play. The goal is to get a traditional publishing deal, to sell the movie rights, and to attract venture capital to make the game for real so that people can actually play it. What have you learned from the process of self-publishing? I’ve learned that you need to treat the enterprise like a proper business. Every aspect that a traditional publisher handles for its authors is something that needs to be tackled: the cover art, the editing, the proofreading, and the marketing. To stand any chance of success, these things need to be done professionally because readers are discerning, and can be unforgiving. If you could go back, what would you have done differently? I would have spent more time with my editor at the start of the project, going through the plot. If we’d have spent a few more hours going through it together I reckon I could have saved myself about 50 hours of additional work later on. Why did you decide to self-publish as opposed to traditional publishing? The first reason concerns the amount of control you have. The things I mentioned above that you need to do for yourself; you have 100% control over them. It might mean a lot of additional work, but it’s also very liberating. The second reason concerns the deadline I was facing – wanting to get the book out in time for the release of the Oculus Rift headset. There was no way I was going to get it published in time if I went the traditional route; it just takes far too long. Because I’ve self-published, my book will be out six months before Oculus, as opposed to six months after it! To be clear, I didn’t even consider traditional publishing. How did the cover art come about? I think the cover is wonderful. Thanks! I went to fiverr.com and chose someone who had created several thousand book covers and received lots of positive feedback. The process involved me having to choose an image from a stock photography site. Naturally I searched for terms like “virtual reality” and shortlisted about twenty pictures. The one I chose incorporated many of the elements from the book. Obviously the eyes are organ of vision, the most important way of perceiving reality, virtual or otherwise. Overlaid on that was a grid, which represents the Player’s Grid, and around the eye were a bunch of numbers, representing the Player Numbers. It just seemed to work so well, and, importantly, still looked good at thumbnail size. Outside of writing, what other hobbies do you have a passion for? Reading (of course! ), travelling, meeting new people and learning about new things. As you might expect, given the themes within the book, I’m especially interested in evolution and futurology. Where is mankind going, and how much control do we have over our collective destiny? Are there any authors that inspired your work on Solarversia? Ernie Cline (author of Ready Player One) and Hugh Howey (author of the brilliant Wool trilogy) were two big inspirations. Ernie proved that you can write a best-selling book about a game played in virtual reality – he led the way. Hugh’s writing is amazingly good, but he also blogs a lot on the topic of self-publishing and his posts have been incredibly useful. What was your biggest fear when sending off your novel for its first round of editing by someone other than yourself? It didn’t really work like that for me. I found Helena (my editor) early on in the process when I’d written only three or four chapters. We worked together on a chapter-by-chapter basis from then on. I was more excited than scared when sending new chapters to her because her feedback was always so insightful. And I loved it when she me praised my work – I felt like a school kid receiving a gold star from my favourite teacher. Did you ever stop and question your own writing? Was there a moment in writing and editing that you considered not publishing your novel? Many times (in answer to the first question). Because I’d spent three months working on a plot I always knew roughly what scene was coming up. But then I’d come to actually write some of them and wonder how the hell I would actually do it. Sometimes the ideas I’d had didn’t translate very well into something that was interesting from the perspective of the narrative, so I needed to change tack somewhat. But not once did things get so bad that I considered not publishing it, not even for a single second. 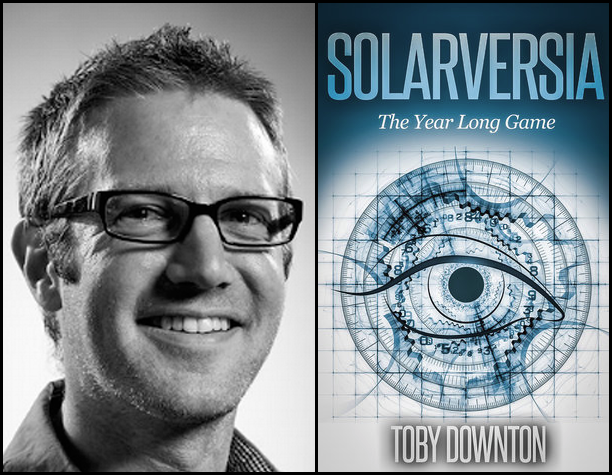 Would you traditionally publish if a publishing company approached you about Solarversia? Absolutely! I think it’s every self-published author’s dream for their book to be successful enough that a traditional publisher takes note and wants to sign them. I think you’d be a fool not to sign up, given that traditional publishers are still the only real way to get your book into retail stores. That’s the missing element for me, and the value a traditional publisher would provide me. Stay tuned! Last question, where on the internet can your readers find you? First and foremost they should check out my About page to get a quick taste of what’s in store for them. My promotional strategy is focused around something called the Golden Grid, which is a 10×10 section of the Player’s Grid. If the book sounds interesting, people should read and review it on Amazon before the 30th September so they can participate in the first competition – Lowest Unique Number – which is one of the challenges Nova, the protagonist, faces in the book at one stage. The winner of that game will win square number 993, which is very central. And as readers of the book know, the central squares are the cool ones! After that, at some point in October, there’ll be a Solarversia quiz to win square number 1897. Also, I’m on Twitter and make a great effort to reply to anyone who tweets me. Come and say hello! A major thank you to Toby for suffering through my questions and for allowing me early access to this really awesome novel. The novel will be released August 31st and I suggest you all jump on this bandwagon before it takes off with out you.